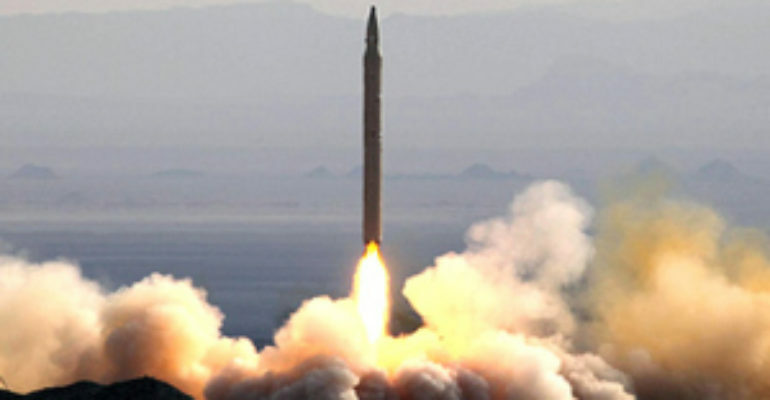 The Qiam is a short range ballistic missile produced by Iran. Declared operational in 2010, the Qiam has a reported range of approximately 800km (497 miles), is liquid fueled, and carries a payload of 746kg. The missile is purportedly based of the design of the Shahab-2, but does not include stabilizer fins as to reduce the Qiam’s radar signature and allow for higher velocities during reentry. As a road mobile system, the missile can be fired from any location. According to Iranian officials, the Qiam is equipped with multi-reentry vehicle warheads (MRV). The missile’s MRV capability enables it to evade missiles fired from missile defense shields. “Iran announces missile breakthrough.” Al Jazeera, March 5, 2014. Accessed April 8, 2014. “Iran Equips Qadr H, Qiam Ballistic Missiles with MRV Payloads.” Fars News Agency (Tehran), March 5, 2014. Accessed April 8, 2014. Ben, Piven “Map: US bases encircle Iran.” Al Jazeera (Doha, Qatar), May 1, 2012. Accessed April 8, 2014. http://www.aljazeera.com/indepth/interactive/2012/04/2012417131242767298.html. Talley, Ian. “U.S. Widens Iran Sanctions for Supplying Missiles to Yemen’s Houthis.” The Wall Street Journal, Dow Jones & Company, 22 May 2018, www.wsj.com/articles/u-s-sanctions-iran-for-supplying-missiles-to-yemens-houthis-1527006421.